The NEW Stampin' Up! Catalog has Arrived! The NEW 2016-2017 Stampin' Up! Catalog is here!! It's filled with all kinds of fun new products for card making, scrapbooking and gift packaging as well as LOTS of ideas to get your creative juices flowing! Go ahead, take a peek inside. You'll love what you see! Stamps are available in 3 types: Clear Mount, Wood Mount & Photopolymer. Learn more about the types of stamps on page 2 of the catalog. I personally love the flexability of the Photopolymer stamps! Stamp images are shown full size. If a stamp image has a coordinating punch or framelit, it will be shown around the image as kind of a shadow and noted underneath the stamp set. The gray color indicates matching framelits and the Ivory color is for a matching punch. One of my favorite things about Stampin’ Up! is their color coordination. You’ll find ink pads, markers, papers & accessories all in the same colors on pages 169-171. You will never have to wonder if everything is going to match again! Here is my gift to you! A wish list! You can download and print this list for your own personal use! Have a Big Wish List? You don’t have to host a party to get Stampin’ Rewards! If you place a $150+ order, you’ll get to pick FREE stuff! Pick from the exclusive hostess stamp sets shown on pages 198-201 or pick anything from the catalog. Plus in June get $35 EXTRA in Stampin' Rewards with a $350+ order. Shop Now! For just $99 you get to pick $125 worth of stamping supplies in your starter kit, plus you’ll get a 20% discount on ALL your orders! Super deal if your wish list is a mile long. 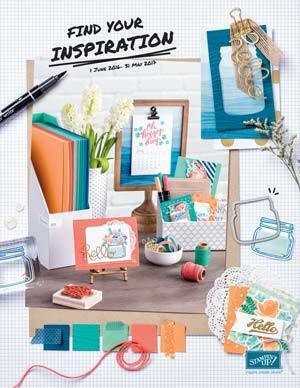 JUNE SPECIAL: Pick 2 FREE Stamp Sets with your Starter Kit! Order your starter kit now. Join NOW! Sure you can look at it online, but there's nothing like flipping through a real copy of the catalog. If you would like to receive your very own hard copy please send me an email at bwaterma@tds.net with your name and address. All I ask in return is a minimum order from you! Thanks so much! Stay tuned! My 10 Year Anniversary as a Stampin' Up! Demonstator is at the end of this month! How should we celebrate? Leave a comment below.